On June 27, youth motivational speaker and author Jeff Yalden was one of the showcase speakers at the National Association of Student Councils’ [NASC] 2017 national conference in Derry, New Hampshire. The three-day conference [June 26-28] was hosted by Pinkerton Academy, a secondary school serving more than 3000 students, and making it easily the largest high school in New Hampshire. Back to the grind today … I'm off to PA to speak at #PFEW. I think this is year 12 or something like that. Can't remember anymore. I just know every time I'm grateful to be a part of Pennsylvania Free Enterprise Week. Whew! Thank you for having me back. See you this afternoon. NASC is a program of the National Association of Secondary School Principals [NASSP], and has been around since 1931. Yalden was happy to be back. He was a showcase speaker at a previous NASC national conference 15 years ago in Cupertino, California. He added that it is always an honor and a privilege to speak at this conference because the advisors have in many cases been with student council for as long as 20 years. “I grew up right down the road in Hollis, New Hampshire, so it was nice to be able to go back home and speak,” he said. His talk centered around personal leadership. He talked about student leaders being comfortable with learning to know who they are – but just as important, also knowing who they are not. Yalden said he tried to keep it simple with the teenagers. “Get to know who you are before you try to impress and win the popularity cote from people,” he said. For student leaders, Yalden stressed that winning a popularity contest should not be the purpose or the direction, but rather a more substantive approach with authenticity and example at the core. “In the end, I wrapped up with this simple question: Are you as beautiful on the inside as the world sees you on the outside? I really invited them as student leaders to take care of the person they are when they look in the mirror in the morning. Focus more on who you are rather than on how you look – and how you look will take care of itself when you focus on who you are,” he said. 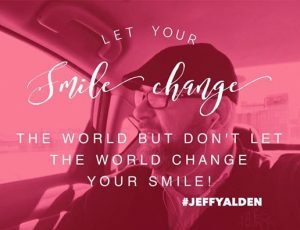 To discover more about Jeff Yalden, visit www.jeffyalden.com. Grab your copy of Jeff’s new book, BOOM: One Word to Instantly Inspire Action, Deliver Rewards, and Positively Affect Your Life Every Day HERE. Check out Jeff’s BOOM Podcast HERE. Join the BOOM Nation Facebook Group HERE.